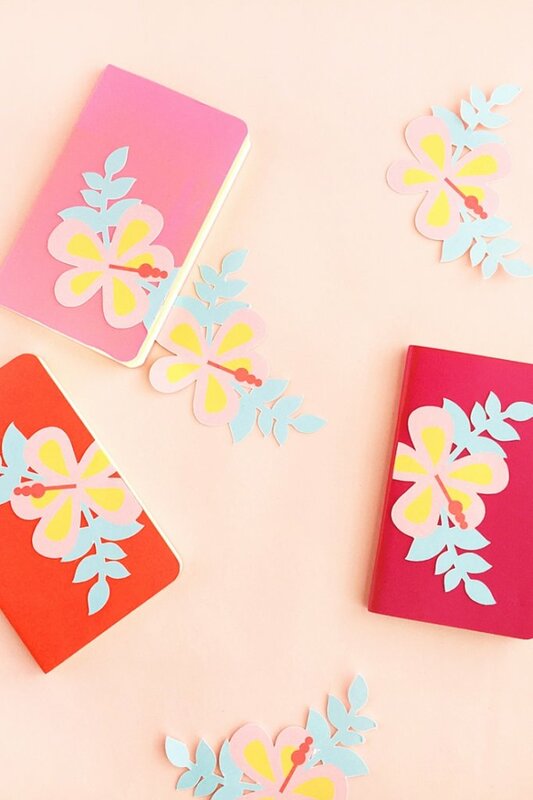 I’m obviously feeling a tropical vibe these days because today’s Mini DIY Hibiscus Journals were totally inspired by one of my favorite tropical flowers. I live in a pretty little neighborhood that reminds me of the movie set of Pleasantville – I kid you not. Some of these pretty little homes have gorgeous hibiscus plants, and I swear I’ve seen some blooms the size of my head. Gorgeous. So here I am surrounded by these stunning flowers, and that led to today’s DIY stationery post. Want to make your own? Read on! Open the flower design (Design ID#136874) in Silhouette Studio®. Adjust your page settings (in the Page Setup panel) according to the size of your paper and your cutting mat. Fill your shapes with color and resize so that they will fit on your notebook. Set the outermost shape to Cut and the inner shapes to No Cut. 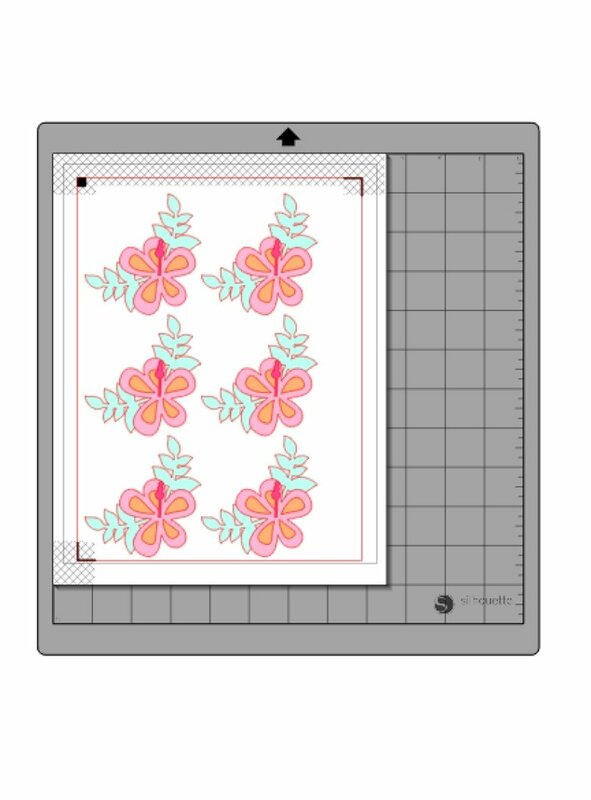 Print and Cut your hibiscus images using sticker paper settings. Adjust your blade if necessary and send your cut job to your Silhouette machine. (Tip: If your machine is having trouble reading the registration marks, try manually moving the blade over the black square using the blue arrows in the Send panel or see the video for “Print & Cut Troubleshooting” on Silhouette’s YouTube channel). 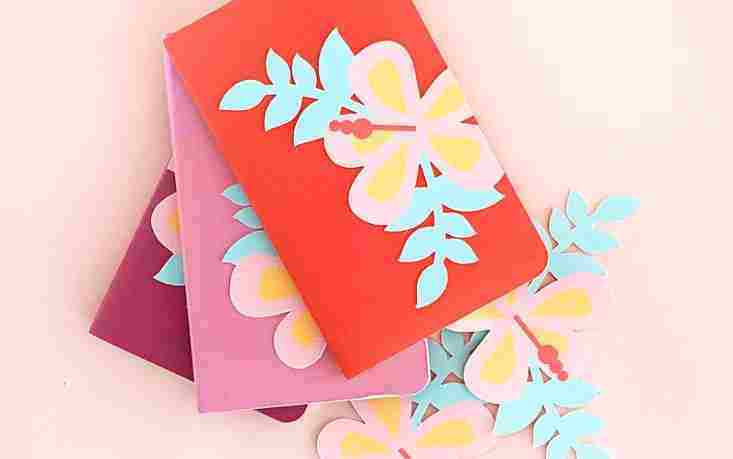 After cutting the hibiscus images, peel them from the sticker paper and place them onto your notebooks. Lovely little books! I may need to relocate to your Pleasantville!